A few weeks ago, I asked for your vote to help send my family to Boston over the July 4 holiday as part of HomeAway's Blog Away contest. Boy oh boy, did you deliver! (A special shout-out to my friends and family, who were absolutely shameless in their efforts to "get out the vote." The 2012 presidential hopefuls could learn a thing or two from them.) I'm happy to report that we won the contest, our flights are booked and our HomeAway house is rented. I say "we" because while I can't pack all of you in my suitcase (darn baggage fees! ), I do plan to report back on all our fun adventures and maybe help to prepare you for your next trip to Boston. Because truly, it's just one of those cities you HAVE to visit. More than once. Want a sneak peak at where we'll be staying? I've used HomeAway several times to book vacation rentals (long before they were sending me on trips!). We've always had a great experience and I'm sure this will be the same. Ever since my sister and I were the Grand Marshals of our neighborhood 4th of July parade at the age of 5, this has always been my favorite holiday. I'm ecstatic to be visiting one of America's most patriotic cities over the 4th this year. If you read my essay, then you know that the last time my husband and I visited, the arrow was with us, although let's just say he was as contained as he could possibly be. 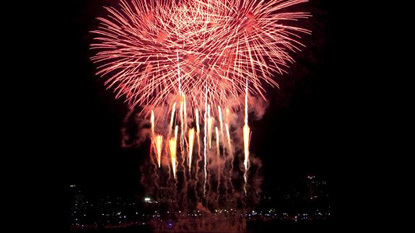 I have a feeling this will be a 4th of July to remember for a long, long time as we experience Boston's Harborfest, culminating with fireworks set off from the Charles River in the heart of the city. That's what I'm dreaming of this week. I'm eternally grateful for all your votes that made this trip possible for our family. And many, many thanks to HomeAway for offering such a great contest to travel bloggers. I highly recommend entering their next contest--and I promise to pay it forward and vote for you! In the meantime, have you been to Boston with kids? Any suggestions as I begin planning our trip? Disclosure: HomeAway is paying $2,000 of our travel expenses. For us, this means they'll cover all of our lodging costs and a portion of our flight costs. We will pay all other expenses. All opinions expressed about the trip, the contest and HomeAway are entirely my own and I was not asked to express a particular point of view. I am required to post a few entries on my blog about our trip, but if you spend any time around these parts, you know I would do that anyway. Photo courtesy of Boston Pops Fireworks Spectacular. Yay! I'm glad you won. It sounds like a great trip. Learn lots of travel tips for me. We'll be heading to Boston next year. Mara's right in here: Mike's is a favorite. I'd add: skip the car rental and take the "T," Swan Boats in the common, USS Constitution, and a walk along the Charles river. On July 4, either stake out you spot early or sneak in on a very small spot later. Boston Harbor cruise (begore/after aquarium), Museum of Science. Forget renting a car. Have a blast. Well done! Sounds like it's going to be a great trip and I'm looking forward to reading about it. Congratulations! Love your blog. :) You should add it to the Time4Mommy directory! That's awesome! So glad you won! Hope you have a fantastic trip. Boston is one of those places on my must-see list, so I'll be curious to see what you have to say about the city on your blog! Hope you have a FANTASTIC Fourth! Congrats! How exciting! I love Boston...in fact, we'll be there this summer too. I can't wait to read about your adventures. Boston is a great walking city so bring the stroller. Keep cool at the Boston Common Frog Pond spray pool and carousel and the Swan Boats in the nearby Public Garden. Have a great trip.